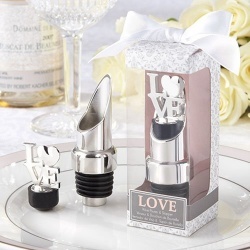 I recently had the opportunity to review a Wine pourer & stopper in the LOVE theme from Beau Coup. These are great wedding favors for a wedding party or even to use at your wedding reception or rehearsal dinner. If you have already been married for some time and looking for a way to keep the spark alive or to celebrate your anniversary the pourer and stopper would be good for that as well. Beau Coup carry’s this product for $3.82 a piece.